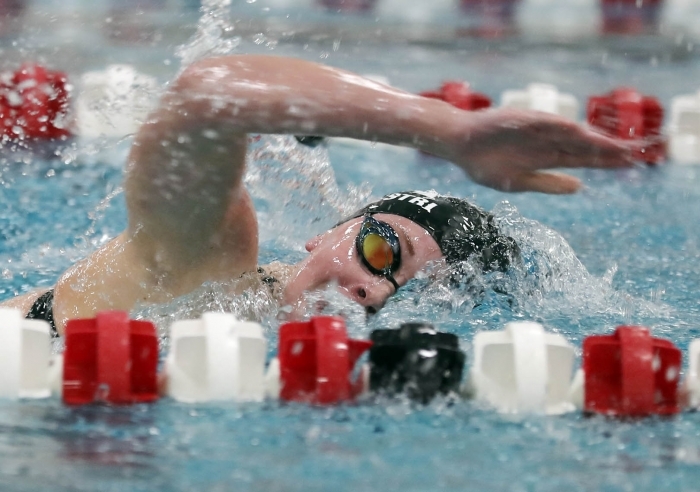 Aegerter, who has verbally committed to swim at the University of Illinois, is seeded first in the 200-yard freestyle and second in the 500 freestyle. She is also on the 200-yard freestyle relay that is seeded second. Like the rest of her senior teammates, Aegerter is hoping to go out on top. Amazingly, though, there was no talk during the season of the Cardinals’ goal of another state championship. “We don’t even talk about state until today at our meeting,” Cabalka said on Monday. “We’ve always been a program always focusing on the week, never getting ahead of ourselves. The Cardinals’ perfect 2018 season came close to ending when Middleton finished just five points ahead of Big Eight Conference rival Sun Prairie at last week’s Middleton Sectional meet. Middleton’s 400 freestyle relay team, which was expected to compete for a state title, was disqualified due to a false start. “It was definitely pretty scary to almost lose that on Saturday on something we really couldn’t control,” junior captain Gabriela Pierobon Mays said. But Pierobon Mays said that will just be one more obstacle for the Cardinals to overcome as they chase down their dreams of a third straight unbeaten state championship season. In the pre-state meet rankings, based on seeds, Cedarburg (194) is ranked first and Middleton (191.5) is second. Sun Prairie (163), Hartland Arrowhead (158) and Stevens Point (155) round out the top five. But the Cardinals have been in this position before. “We were picked to get second by eight points last year,” Pierobon Mays said. “That hit us harder because all season long in every meet we were seeded first. Then we go to state and we’re seeded second. It took us all week last year leading up to state to realize we could do that. Middleton cruised to its second straight state championship a year ago, finishing with 313.5 points. Cedarburg was runner-up with 242 points, while Arrowhead came in third place with 189 points. Middleton’s scoring received a boost from one individual champion and a pair of relay champions. Pierobon Mays successfully defended her title in the 100 butterfly. The Cardinals also won the 200-yard medley relay and repeated as champions in the 200 freestyle relay. But after recovering from shoulder surgery on Feb. 26 for a torn labrum in her right shoulder, Pierobon Mays knows she will have a battle on her hands to repeat in her signature event. “I swam OK at sectionals, but it wasn’t as great as it could have been, should have been,” said Pierobon Mays, who will also compete in the backstroke on the 200 medley relay and is seeded ninth in the 100 backstroke. That attitude is what drives the Cardinals toward their annual goal of a state championship. Middleton qualified 10 swimmers for 17 swims, including two relays. The Cardinals’ hopes of a third consecutive state title will rest on seniors Aegerter, Makenna Licking and Cora Mack — an Illinois State recruit — as well as juniors Alex Anagnostopoulos and Pierobon Mays, who all were on both state title teams. Senior Emily Keebler, junior captain Berkley Smith and sophomore Ally Silvestri were on last year’s state title team, while sophomore Madelyn Lawn and freshman Amanda George are making their state debut. Smith will compete on the 200 medley, which is seeded fifth, 200 freestyle relay and in the 50 freestyle, where she is seeded 12th. While the last team to win at least three consecutive Division 1 state titles was Arrowhead, which strung together five in a row from 2002-2006, Smith likes the Cardinals’ chances at an unbeaten threepeat. Cabalka said unlike the past two seasons, the Cardinals will be only be spectators for the meet’s final event — the 400 freestyle relay. “It puts us in a weird place where we’re not in control of our destiny at the end,” she said. “After the breaststroke is over, we have to sit there and watch. If we’re 40 points up going into it, we’re good. It’s a tight race. Cabalka, though, said the Cardinals prefer to deal with what they can control.